The Board of Supervisors has initiated an Adopt-A-Roadway Program in an effort to clean-up litter and improve the overall appearance of roadways. There are now thirteen individuals or families who have volunteered their time and energy for our community. They have been at work and are making a difference. It is not too late for you and your family to become involved. 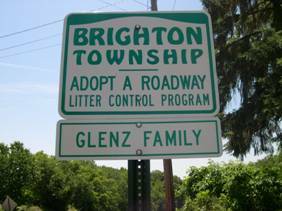 Under the program Township roads (or segments) are adopted by a volunteer group or family who collects litter on a Township road a minimum of two (2) times per year. We have even had one family adopt Dawson/Baker Fields under the program, and other parks are available too. The Township will provide the installation and maintenance of permanent signs noting the program and the participant, “Litter Crew Ahead” signs, bags for collection of litter and the collection and disposal of the bags of litter collected under the program. Participation in the program is subject to certain conditions and safety recommendations. This is a great way for families and organizations to become involved in the community in a highly-visible and productive program. Please contact the Township Office at (724) 774-4800 or bryand@brightontwp.org if you have interest in becoming involved. The Township will then schedule an informational meeting with you to review the program. As well, several organizations such as the Rotary Club of Beaver participate in the “Adopt a Highway” program along Tuscarawas Road in partnership with the Pennsylvania Department of Transportation.